The goal of the Wildwood Christian Academy's Dress code is that students present themselves in a clean and neat manner as a representation of Wildwood Christian Academy. While we recognize the uniqueness of each student and seek to develop individuality, it is also important for each student to understand the concept of appropriate dress for particular situations. The criteria for the dress code promotes modesty, respect, safety, and discretion. Uniforms are the required dress code Monday through Thursday. Friday is casual day. 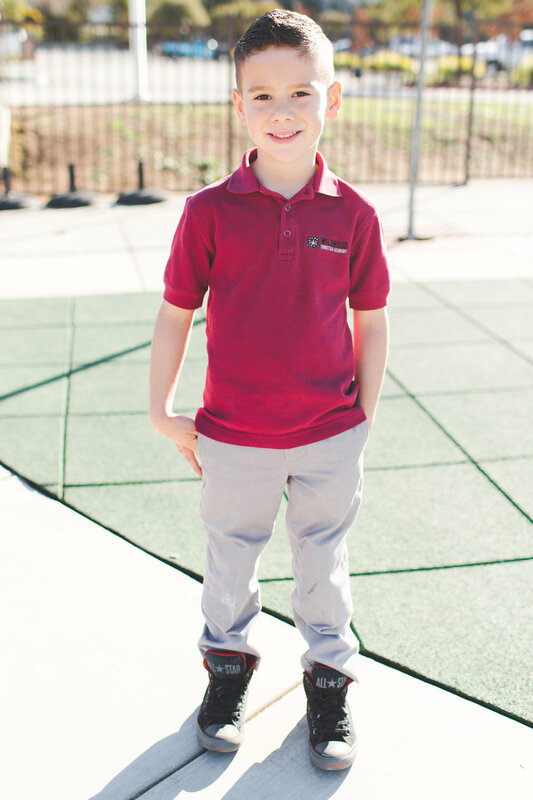 School uniforms can be purchased in the Dennis Uniform Store in Yorba Linda and they are available to purchase online. Parents are able to buy SCRIP for the Dennis Uniform and utilize a 3% credit towards tuition accounts. We have chosen Dennis Uniform for our uniform supplier. *All main pieces (I.e Polo, pants, shorts, blouse, skirts, skorts, and jumpers) must be purchased from Dennis Uniform. K - 5th Grade Boys: Cardinal polo with the Wildwood Christian Academy logo. Uniform pants and shorts must be gray and purchased from Dennis Uniform. K - 1st Grade Girls: Jersey blouse with the Wildwood Christian Academy logo and plaid jumper. Girls are required to wear black bike shorts under the jumper. 2nd - 3rd Grade Girls: Jersey blouse with the Wildwood Christian Academy logo and plaid skort with crossover tie. 4th-5th Grade Girls: Jersey blouse with the Wildwood Christian Academy logo and plaid skort. All students must have a minimum of 1 full uniform with the Wildwood Christian Academy logo. These items must be of good quality in order for students to appropriately represent Wildwood Christian Academy in the community. Socks must match the school uniform. White, black, or gray colored socks. Colder weather and outerwear: Dennis Uniform has pre-approved outerwear options: Black sweater with WCA logo and black jackets for boys. Gray cardigan sweater with WCA logo and black jacket for girls. All outwear and jackets must be black. In the cold weather months: K - 5th grade girls are encouraged to wear black or gray leggings under jumper, skort, or skirt. Students must wear predominantly black colored tennis shoes or dress shoes with the school uniform. Boys must wear gray pant and cardinal polo to chapel. Girls are to wear their regular approved uniform.